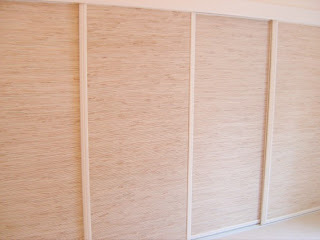 I was so excited yesterday after finishing our wallpaper project that I had no time to Blog about it. So without further ado………another project bites the dust! After: I Love my "NEW" Closet Doors! We have (had) 4 mirrored closet doors when we bought our little gem of a house a few months back. 4 ugly, huge, did I mention ugly? 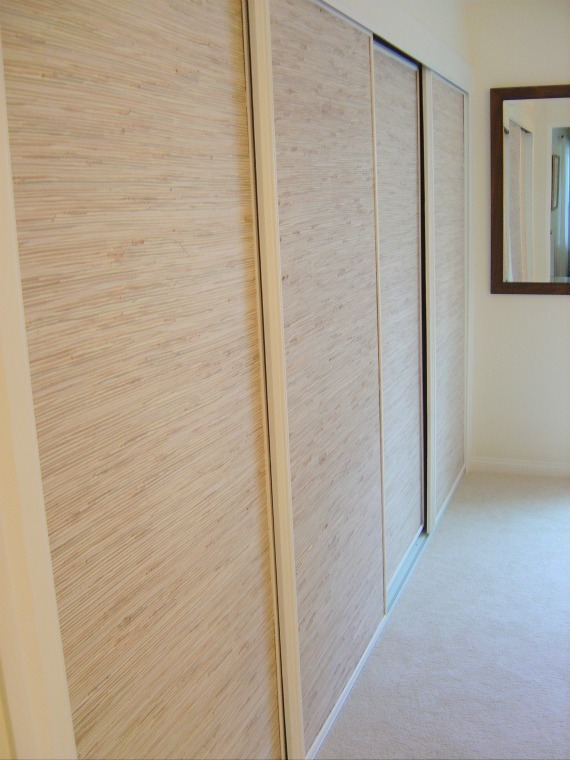 closet doors. Framed in fake wood and a bit worn out to say the least. 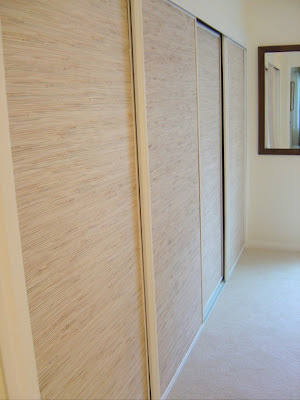 Well adios, bye-bye and so long ugly and HELLO beach inspired, over the top, coastal cool closet doors! The fix: I wallpapered them in Grass Cloth Wallpaper. Oh yes there is a wallpaper glue that will hold that paper on mirrors! Below I have made a list of supplies you will need to cover ugly closet mirrors. I love doing projects on a shoestring. The total cost for all the changes we made was approx. $250. This included the new trim around the door a new white track for the doors, wallpaper, paste and paste spreader. To replace old wheels (we are waiting on that) they can be purchased at Lowes but are a bit pricey at $9 per wheel and mechanisim. Our Closet Door mirror width was 32-1/2” wide. 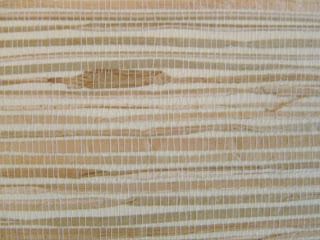 Grasscloth comes in a 36” width so you just cut off what you don’t need. I recommend cutting the width with scissors first. 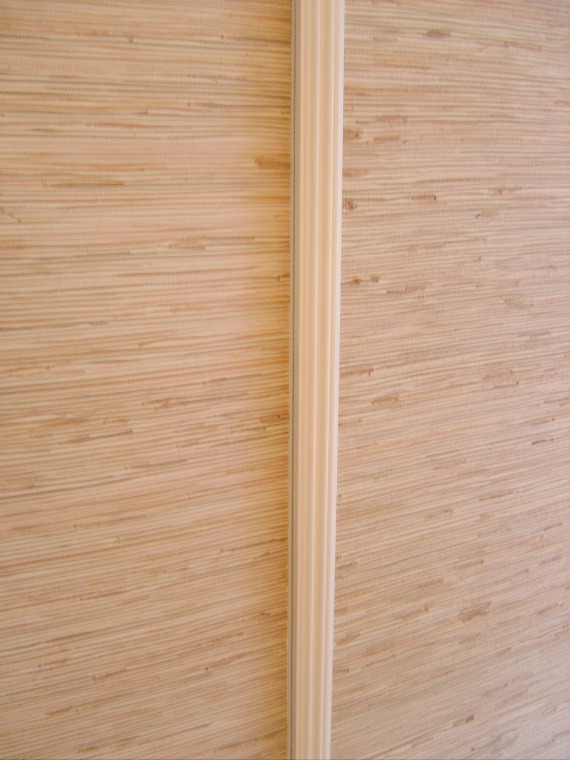 Cut each length about 1” over what the mirrors height measures. Spread the paste covering the entire mirror, apply paper starting at the top working and smoothing your way down to the bottom (make sure sides are kept straight). The bottom will have a small amount to trim (this will need to be cut very carefully with an extra sharp blade. The spreader spreads the paste and also can (after washing paste off) can be used for smoothing out the paper. Never smooth top to bottoom only left to right on a Grass Cloth surface. Set aside and do the next door. Hang doors and VOILA! New Look for a fraction of the cost of new closet doors. Plus you will be the envy of all your friends…just don’t tell them that you are available on Saturday! Looks nice. Couple questions. 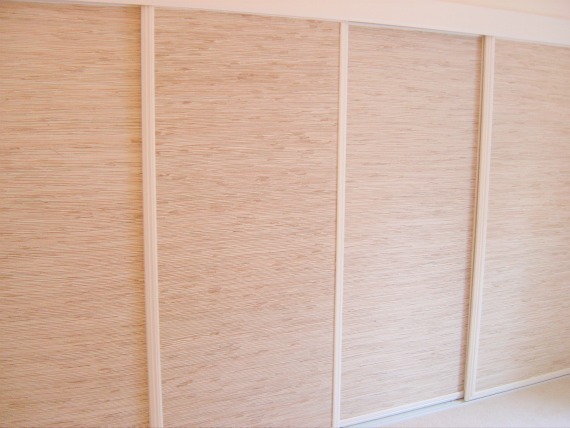 Did you paint the frames around each panel? Mine are that old brass look and I'm not sure paint will stick. You first mention cutting the width with scissors and don't mention an overhang. There is mention of overhang for length though. If you have the time, could you provide a few more detailed specifics on how you got such a great outcome. In our master remodel we are getting brand new doors but three other bedrooms all have the brass and mirrors that will start to bug me. Thanks. Yes I did paint the frames around each panel. Mine were wood. I lightly sanded, primed and than painted 2 coats on each. 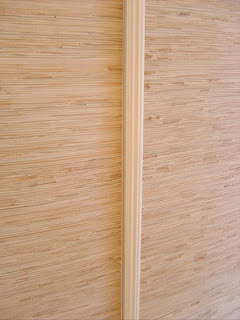 I cut the width of the wallpaper exactly the inside width of the frame. I did not allow for any hangover since it would be very hard to trim accurately once it was glued down. I did allow for hangover at the bottom, but once it was set in place I was able to easily trim it at the bottom. The other thing that really helped hide any of the mirror if it was not cut spot-on was the paint. When I painted the frame a little got on the mirror. If the frame happened to be a tiny bit wider in areas the paint hid the mirror! Where can I purchase the wallpaper? Wallpapers to Go ! Thanks so much for the Inquiry! Thank You .. Quick Question can this process be used in a rental ? I would definitely ask the owners first since this is permanent once the grass cloth wallpaper gets glued onto the mirror. But I think it is worth asking! 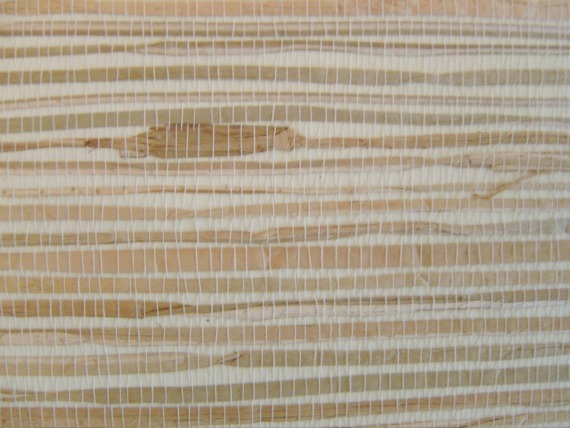 Do you remember the name of the wallpaper you selected for your doors. You did a great job and I'm trying to find wallpaper to cover up my old sliding closet doors when you come in my townhouse. Thanks. Papers To Go store. It is a Grass Cloth which should be readily available . is this the name of the wallpaper?